Welcome to another Blog Party. Tonight, we're letting our Geek flag fly, and giving the world of Sci-Fi the cocktail hour treatment. Heck, I've even dug out my Star Trek (original series) uniform for the occasion. Don't believe me? Click here. Small group tonight, but I'm actually not surprised. Science fiction does tend to scare off many a cook, but not us! No, intrepid foodies that we are, we've happily faced the challenge, with some amazing results. But before we give the food a test-run, we need to get in the mood. Oh, I had fun. In fact, I'm using albums from my own collection. No, I'm not a geek, but I am married to one! Still, it takes two to tango, as they say. 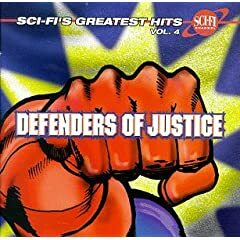 A great bunch of songs to start us off, Sci-Fi's Greatest Hits, Vol. 4, with everything from the operatic theme to Underdog, to various forms of Batman's tune, to the X-Files. It's fantastic. And so much fun to hear those sci-fi themes again. And there's no way we could do a sci-fi party, and not include Star Trek! 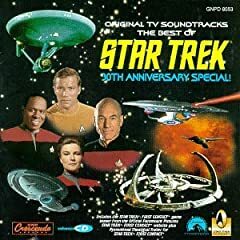 So, sit back & enjoy the theme songs, and selected musical suites, from the first four shows with The Best of Star Trek: 30th Anniversary Special. 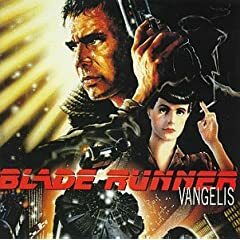 The outlook's a bit bleak, but you can't beat the futuristic style of Blade Runner, and the music's not bad, either! Now that we have suitable background music, let's check out some of the nifty sci-fi goodies I've found for the party. I just couldn't let the night begin without a blessing from the Patron Saint of Science Fiction, and Geeks, everywhere...so, be sure to give a little nod to this fabulous Capt. Kirk stand-up, ok? How could we explore the food of science fiction without a few cute aliens around?? Something I'm a bit too young to have known about, but Matt (the 'old' man) brought to my attention, I simply had to bring to the party: Space Food Sticks! How cool is that? Ok, on to the food! You guys are incredible, you know that? I'm so impressed with each & every interpretation of Sci-Fi; they're all fantastic. Don't believe me? Well, see for yourself. First guest to arrive is always anticipated...I can't wait to see what you guys bring! 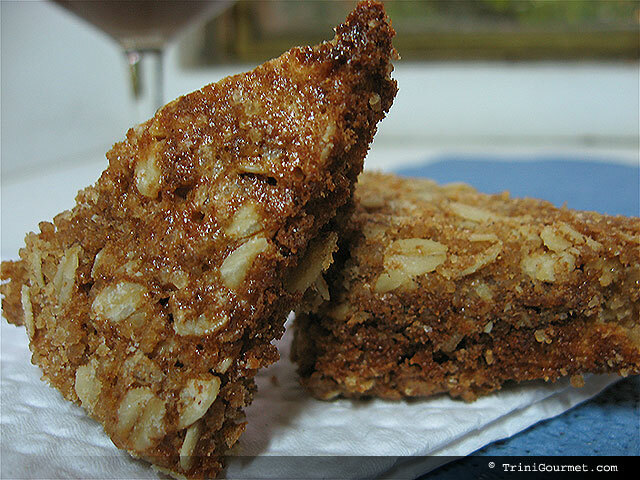 Ok, you absolutely have to try these amazing cookies from tigerfish! I love it...sweet snack, or ancestral building materials? Seriously, though, be sure to grab a Chewbacca Cookie. Tonight, it's ok to play with your food! And I think pairing it with a nice cup of tea is perfect. Thanks, tigerfish! Sarina's back for another party, and she's gone the astronomical route with her Chocolate Saturns, and Ginger Trigs. A happy kitchen accident turned hard-to-put-down ginger treat? Brilliant. And Sarina, love those 'rings' on the Saturns...good to have you back! Eva's gone classically sci-fi tonight, invoking this novel, and I know you're going to love these Nemo-inspired bites. They're almost too cute to eat! 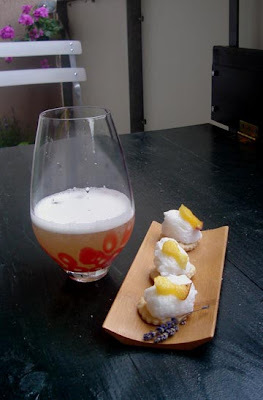 And this underwater-inspired Limoncella drink isn't far behind. It's all fantastic, Eva! Kim's a newcomer to Blog Party, but had no trouble coming up with some super sci-fi goodies for us tonight! I mean, get a hold of these freaky (and I mean that in a good way) Oozing Flying Saucers, and Tentacle Creatures! I mean, seriously...that could have come from an early Star Trek set. And you can even choose between an Alien Egg Mocktail, or a Swamp Monster Cocktail! Way to make an entrance, Kim...everything's wonderful! Late or no, J's made sure we have plenty of outer space nibblers tonight. And she even had themed serving dishes! I'm not even sure where to begin...as with the stars in the sky, there's almost too many star-shaped bites to count, like the Crab or the Smoked Salmon & Cream Cheese, as well as Parmesan Stars. The moon got her due, as well, with these Tuna Pate Toasted Moons (for the record, I also have moon and star cutters!). 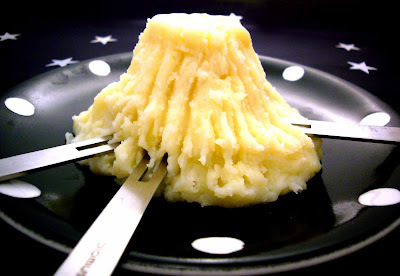 But what got me was the Mashed Potato Mountain; a la Close Encounters of the Third Kind. I've always wanted to make a tater sculpture! Not satisfied with this savory constellation, J also brought Ice Cream with Mars Bars Balls...whew! To wash all that down, try her Chambord Energizer, too. Wow, J...impressive, as always. As for me, I took the theme in three directions. First, I felt there should be a nod towards an earlier generation, when men first walked on the moon. When astronauts were heroes, and Saturday matinees featured little green men. So, enjoy a Tang Float Shot; Tang (what the astronauts drank! ), frozen into a shot glass (these things are so cool), and filled with a spoonful of vanilla ice cream. It's a dessert cocktail! To go with, I give you dessert before dinner: Astro-Cookies! A recipe from Betty Crocker's Cooky book; Coco Puffs (yes, I just typed 'Coco Puffs') are coated with a wonderfully chocolatey mix of sugar and butter, corn syrup and chocolate, and formed into balls. The result? A crunchy, Oreo cookie like treat. And they're just so neat! Next, I had to go Star Trek. And if I'm going Star Trek, I'm going original series. So, appetizer-sized servings of Mr. Spock's favorite, Plomeek Soup; a vegetarian dish made mostly of sauteed onions, carrots, and celery, simmered with vegetable stock, pureed, and finished with a touch of cream. Delicious. Too good to throw at poor Nurse Chapel. For the beverage, I really wanted to make Finagle's Folly, but didn't have the proper ingredients. Instead, I offer you Romulan Ale. And just like the props department for Star Trek, it's just blue Gatorade. But hey, it looks like it could be a space drink! Finally, we move on to the Blade Runner-inspired pair. Have a cup of Decker's Noodles...about the only time you see anyone eat in the film, it's when Harrison Ford stops at a street vendor, asks for four of something (apparently, he can only have two), and tacks on an order of noodles. For the party, it's just small cups of Udon. And the drink? Why, it's One on the House at Taffy's...not much detail given in the film, but our version is simply apple juice & star anise. Looks pretty darn futuristic, doesn't it? And truthfully, it tastes good. Ok, this is the time when we eat, chat, and just generally kick back and have a good time. Thanks to everyone who came, and I sincerely hope you'll be back next month for the extra-special (and potentially final) Blog Party#24; our two-year anniversary! Tonight's party-goers will get a heads-up to July's theme soon; everyone else? Check back tomorrow! J, I'm adoring those mashed potatoes, seriously! Sarina, it's not set in stone just yet! Thanks Jeanne...hang on, just how many do you know? Happy National Peanut Butter Cookie Day!